Just like a Neon LED power efficient light-up sign this unit comes complete with an AC adaptor all ready to plug in and use (power is 12V 500ma). Available in cool white, red, blue and green this display is very bright and can be seen very well even in direct sunlight. This sign is carved on our CNC router with a V shaped bit which reflects the very bright LED lights around the edges of the carved acrylic sheet. 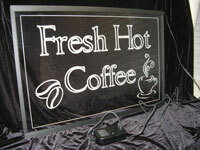 Increase your coffee sales with this bright attractive window sign or hang above your coffee counter. Really bright and attracts attention. We can also carve any logo or custom branded graphics upon request, please call for pricing. We do offer quantity prices contact us for details. If you do not specify color we will ship the cool white which is pictured here.